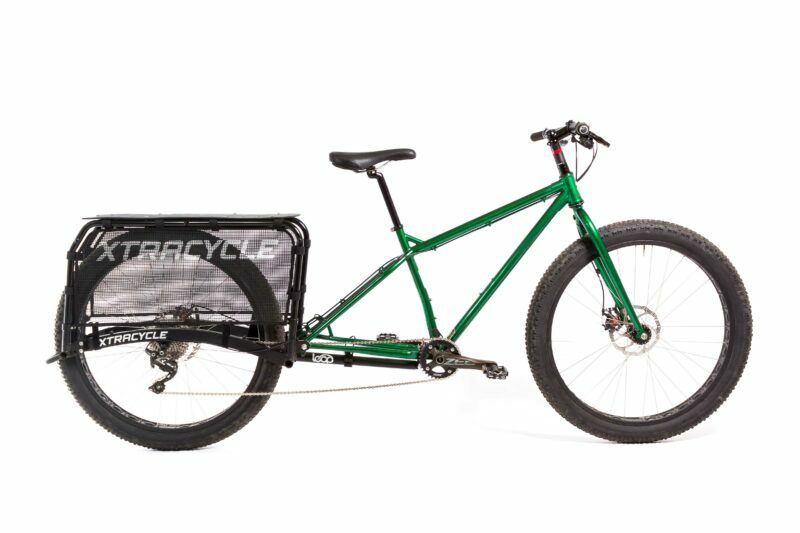 Our FreeRadical Leap radically transforms mild-mannered regular bikes into super-cargo heroes, able to carry large loads and extra passengers. Camp gear, kids, kayaks, dogs, lumber for bonfires or home repair projects, weekend thrifting treasure hauls, coolers full of ice to keep the kickball team hydrated, the FreeRadical Leap kit’s got your back. Turn nearly any ordinary bike into the extraordinary and get to hauling with this stellar conversion kit. Many of you may recall – or may even still ride! 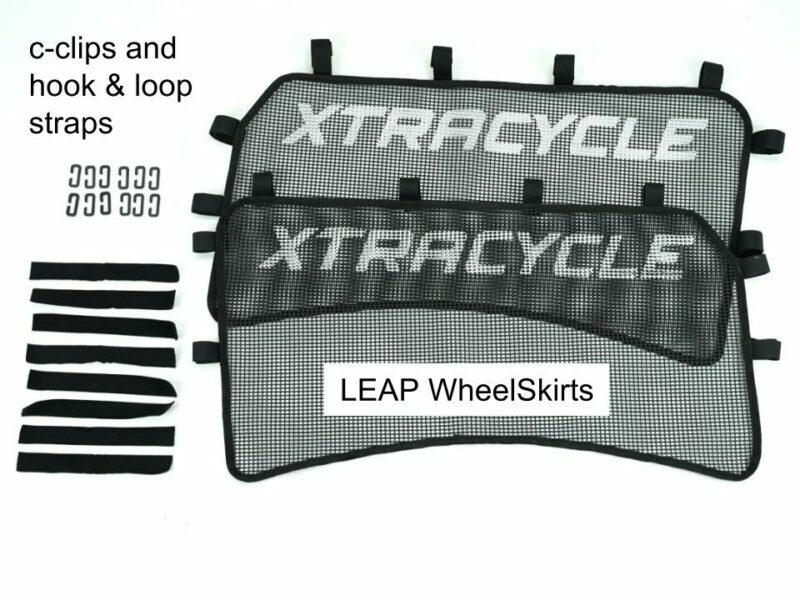 – the revolutionary original FreeRadical conversion kit that launched the Xtracycle brand back in 1998. That kit could haul. This new and improved FreeRadical Leap is super rugged and incredibly rigid while at the same time lookin’ real sharp. The kit essentially bolts into your rear drop-outs, extending your wheel base. The installation clamps mount firmly to your bike’s chainstays near the drivetrain (i.e., the bottom bracket), creating a super-strong connection. 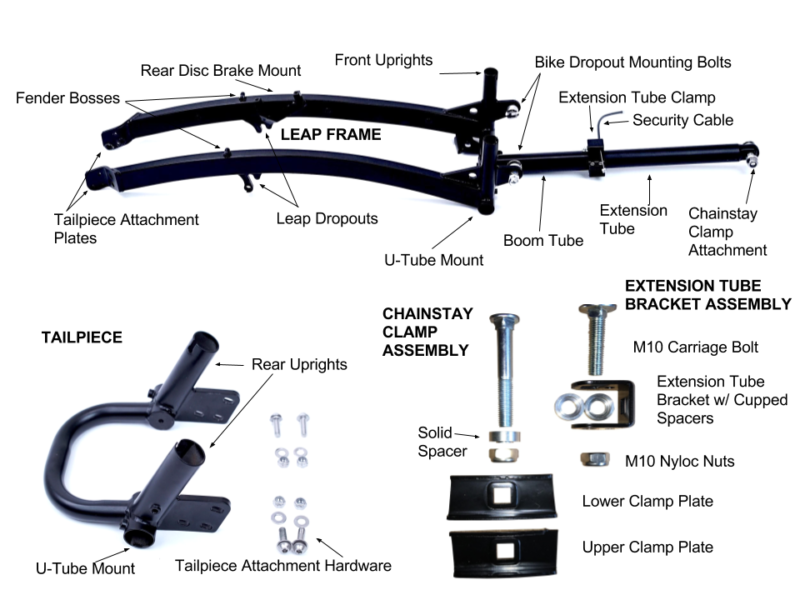 This ensures that your Leap converted bike won’t just feel like a “bike with a conversion kit” on it but more like a solid cargo bike frame. 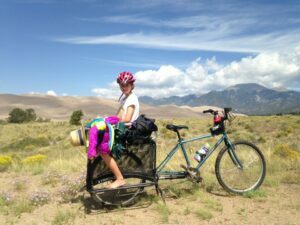 With our wide ranging Super-Modular Accessory System for hauling both kids and cargo, you can easily build up your Leap cargo bike to meet your needs whatever they may be. Unlike the original FreeRad, which could only accommodate 26″ and 700c tires, the Leap can be installed with bikes with 20″, 24″, 26″, 650B, 650B+, 700C, 29er, and 29+ tires, with a max tire width of 3″. The added bonus is if you are looking to build a cargo eBike now or down the road, there are various eBike conversion kits that can help turn your Leap into a super bike. 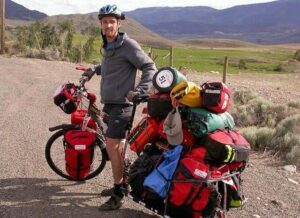 You love your current bike but want to carry more stuff with it: Some people have a different bike for every situation. Some people have one bike that they’ve poured their heart and soul into. Maybe you love your current bike, but you just want it to do more for you. Add a bolt-on kit to your faithful steed so you can use it for literally everything. You like tinkering and taking on bike projects: Bolt-on kits are great for DIY-ers and home mechanics. In comparison to the complete cargo bikes, kits require more tinkering. You have to make sure your bike is compatible, and depending on the condition of your current ride, you may find yourself rebuilding the drive-train to some extent. You’ll definitely have to extend your bike chain, and add tandem-length cables and housing for your rear brakes and rear derailleur to reach the rear wheel, which is now further away (these cables are include with a Leap kit). Of course, you can always take this project to your local bike shop, but don’t be surprised if you unexpectedly have to replace a few additional parts to ensure that the whole setup will work together. You have a very specific cargo bike in mind that you haven’t been able to find: We love our EdgeRunners, but they only come in so many versions. 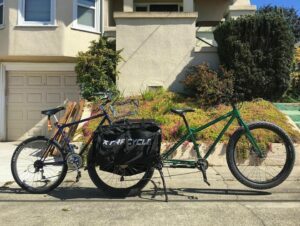 Looking for a 29+ cargo hauler to take bike-packing or mountain biking? Hoping for a beach cruiser version with balloon tires? A FreeRadical Leap kit has you covered. 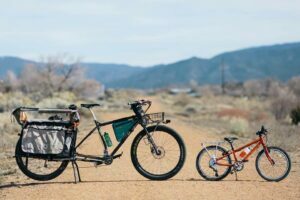 You’re looking for an affordable way to try out cargo biking: In case you’re not yet totally positive cargo biking is your thing, a bolt-on kit is also an excellent way to start cargo biking without breaking the bank. Throw it on your commuter and try it out for a few weeks! We’re pretty confident you’ll love it, but if you don’t, you can always take the kit off and put your bike back the way it was. And on that note…. You want to be able to go back and forth between cargo and, well, not cargo: As stated above, a cargo conversion is by no means permanent. Maybe you want a cargo bike during the summer because you never drive your car when the weather’s nice, but you’d like to take it off in the winter (sometimes when it’s snowing out, you’d rather use the car for those errands). Or you need cargo space for daily commuting, but you’re planning a week-long bike tour and you want to travel light. We won’t say it’s a snap to install and remove a bolt-on kit, but it doesn’t take an eternity, and we love having the option. The FreeRadical and FreeRadical Leap have been used for everything from grocery runs and school drops offs to intercontinental adventures and epic back country camp trips. No matter how big or small your plans are, the FreeRadical Leap is sure to bring in a little extra magic into your life. So what’s included in the kit? US Design Patent Number: D766137.